One morning, I offered to cook dinner. In Nepali homes, the guests do not enter the kitchen, so I really didn’t know how this was all going to work out. Our friend, Shree, has a chicken farm and had been telling us that he was going to bring a chicken for dinner one night. Everyone wanted to taste American food, so it made sense that I would cook. When asked what ingredients I would need, I had to stop and think of what exactly I was going to cook. Chicken with garlic, onions and potatoes, green beans and tomatoes on the side. Sounds easy enough. Now for the spices, do they have any thyme or oregano? What about olive oil or some butter? 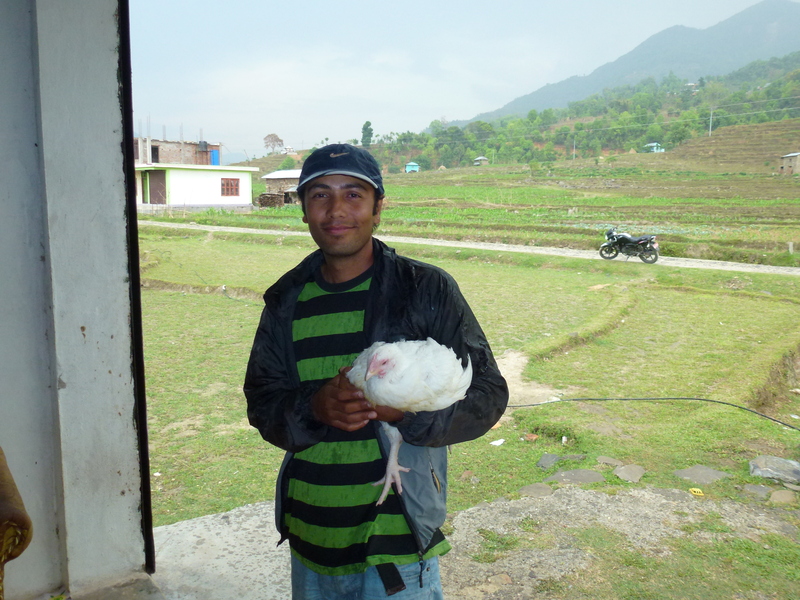 In the late afternoon Shree came down from the chicken farm with a live chicken in his arms. He put it in the storeroom to wait until the water boiled, in order to pluck the feathers. With a quick slice, and a dunk into the boiling water Shree began plucking. Since we didn’t have the knives to butcher it, Shree took the chicken to the local butcher. He asked me how I wanted the chicken cut and I told him that any way the butcher did it was fine with me. I had begun to cook the potatoes, onions and garlic when then the power went out. It was getting dark, and this reminded me of the times when I was using a camp stove. The kitchen does not have any running water or refrigeration and without light it was hard to see what I was cooking. When Shree returned with the butchered chicken, he handed me a small black plastic bag, full of a cut-up chicken, every part of it including the bones and organs. Nabaraj and Shree returned with the local wine and a few neighbors stopped by to taste American food. We all laughed and had a good time. Even Shailee and Bimala (Shailee’s cousin who lived with them) ate with everyone in the living room. Funny thing though, the chicken tasted Nepali. I think the spices are embedded in the wok. When Shree asked me what the name of my dish was I said “motorcycle chicken.” He just smiled and knew why. I named it that because the chickens are carried, live, to the markets tied to the handlebars of the motorcycle.